The chart below highlights the real-time performance of our Ratings Recommendations service. We have yet to find a mutual fund or another online advisory service with performance that compares to these numbers. Real-time Performance of the Super Stock Screener Ratings Recommendations. Note: The information in the chart above is based on real-time performance of our recommendations to Super Stock Screener members. 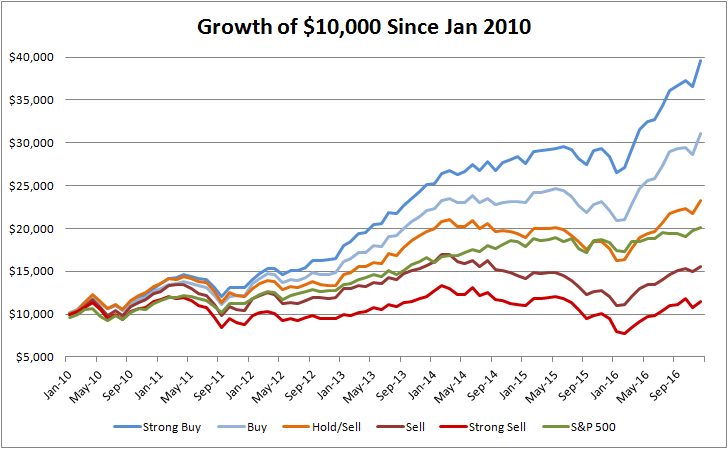 If you started with just $10,000 at the beginning of 2010 and followed our recommendations by only investing in stocks rated as a “Strong Buy”, your $10,000 would have grown by 296% to $39,643 today! HOWEVER had you invested in the broad market or a mutual fund, you would have earned 100% and only have $20,077 in your investment account. You deserve more. Our members love our service because we help them pick BIG TIME WINNERS, and also help them weed out big time losers. Ignoring this advice will cost you a lot of money! "If you’re not satisfied, we don’t expect you to pay. That’s our commitment and your 100% satisfaction guarantee." How Does It Work? Is It Easy To Use? Our members typically focus on picking stocks rated as a “Strong Buy” or simply a “Buy”. At the same time, they remove stocks from their portfolio that are rated as “Sells” and “Strong Sells”. 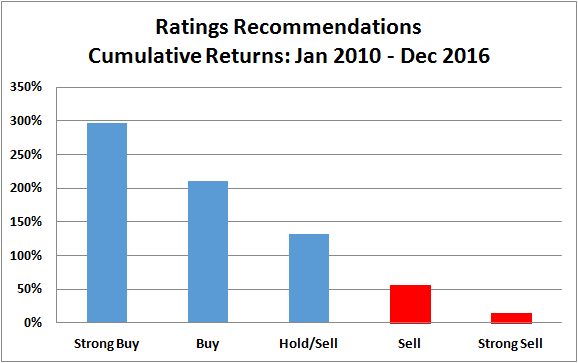 Meanwhile, some members prefer to combine our ratings with their own indicators. History has shown that listening to these recommendations can pay off tremendously! Notice the consistent outperformance of the stocks rated as “Strong Buys” and “Buys” (see chart below), compared to stocks ranked as a “Hold”, “Sell” and “Strong Sells”? The alpha is massive and ignoring these recommendations can make a huge difference in how much money you earn or lose each year. Stock Picks That Make You Money! Click the button below to get access now. all 3 services at no charge. U.S. Government Required Disclaimer - "Stocks, Options, Binary options, Forex and Future trading has large potential rewards, but also large potential risk. You must be aware of the risks and be willing to accept them in order to invest in the stock, binary options or futures markets. Don't trade with money you can't afford to lose especially with leveraged instruments such as binary options trading, futures trading or forex trading. This website is neither a solicitation nor an offer to Buy/Sell stocks, futures or options. No representation is being made that any account will or is likely to achieve profits or losses similar to those discussed on this website. The past performance of any trading system or methodology is not necessarily indicative of future results. You could lose all of your money fast due to: poor market trading conditions, mechanical error, emotional induced errors, news surprises and earnings releases."